Abraham path was the idea of William Ury and his Harvard colleagues. The idea was to follow in the footsteps of Abraham which is the origin story of the Middle East. The origin story can be phrased: ‘4,000 years ago, a man and his family walked across the Middle East, and the world has never been the same since’. Abraham stood for unity of the family, the family being everyone – the interconnection and unity of all mankind. William Ury sees Abraham’s story as the symbolic third-side of the Middle East, and the path as a link that crosses in and out of 10 countries, some with difficult or what seem impossible conflicts. The idea is that the story of Abraham links all those countries and its stories which unite them all with a common identity. Every conflict or dispute has two sides, the third-side is a metaphor for the community, friends and anybody who is close to the conflict, who can remind the two-sides what is really at stake, to ask ‘let’s stop fighting, and lets start talking.’ Mediation offers that too. We as mediators offer the two-sides a chance to talk and to stop fighting, whether it’s families, communities, neighbours, partnerships or two-sides of a contractual agreement. Mediation gives them a chance to retrace their steps of the past in search of a better future – agreement and, if possible, reconciliation – that is the third-side at work. Abraham’s path is not simply about a route but a route for conversation, because as people talk they engage and listen to one another. Mediation is a type of walk, a path to resolution where the parties in dispute come together to negotiate something which has reached an impasse – it’s as simple as that. However, that’s not to say it’s easy. People are in conflict, they’ve stopped communicating and taken positions, often reinforced by legal points. They often prefer to have a referee or tribunal to say ‘you’re right, and you’re wrong’, and it seems easier that way as it’s out of their hands, a reason to stop talking, to leave the path they were on. As a mediator I see it in every dispute I engage with, where the disagreement begins, enters a communication mode of reaction and attack, conflict occurs, communication is intransient, often followed by no communication at all. As a mediator it is my task to assist the parties to step back from the conflict and look to the future, give them perspective of what is truly important, that is to fix the conflict between themselves, on their terms, meeting their needs and interests, based upon the future and a common identity. Mediation brings them back to the path, to start walking and talking. 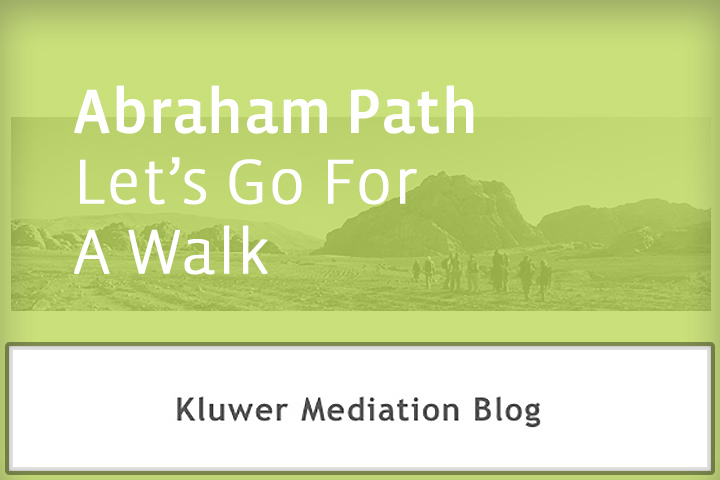 No Replies to "Abraham Path - Let's Go For A Walk"